Terry Wise’s memoir, Waking Up, captures in remarkably concise prose her personal journey through near deadly depression. We are confronted immediately with her unrelenting despair associated with caring for her husband as he succumbed to ALS. They struggled together with this diagnosis that was rendered shortly before their wedding. As this debilitating disease followed its course, Terry describes in profound terms the impact of terminal illness on caregivers and loved ones. In this struggle, Terry came to feel alone. Her compelling and gritty account describes a desperate depression that marked the beginning of a long road of personal recovery. In the unfolding of her narrative, Terry reveals the strength and power of a therapeutic alliance that allowed for discovery and healing. Her experience is a testament to the importance of maintaining flexibility so that both the patient and therapist guide the path through to recovery. Everyone must follow their own way. 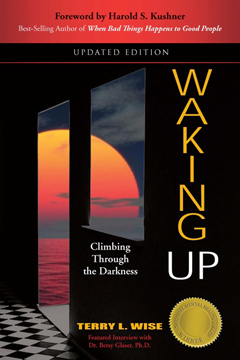 In Waking Up, Terry Wise intimately describes several topics critical to medical education today including caregiver morbidity, the power of a therapeutic alliance, the effectiveness of combined pharmacotherapy and psychotherapy, and the resilience of the human soul. As a member of the faculty of Harvard Medical School, I have discussed this book with many students and trainees, and recommend it as a valuable addition to every health care provider’s reading list. More specifically, I have recommended Waking Up for the reading list compiled by the student liaison of the Healer’s Art curriculum at Harvard Medical School and also as a selection for the faculty narrative medicine group at the Massachusetts General Hospital. Terry’s resilience and perseverance are demonstrated in this gripping account of her journey to the depths of despair, and her path along the road to recovery.